“Celery is one of the most powerful anti-inflammatory foods because it starves unproductive bacteria, yeast, mold, fungus, and viruses that are present in the body and flushes their toxins and debris out of the intestinal tract and liver. Pathogens like these are so often the underlying cause of inflammation—in their absence, your body is much better able to handle whatever life throws your way. At the same time, celery helps good bacteria thrive. Consuming celery is the most powerful way to alkalize the gut. That’s in part because celery (which is technically an herb, not a vegetable) is high in bioactive sodium. It also contains cofactor micro trace mineral salts as yet undiscovered in research. These are varieties of sodium and other trace minerals (more than 60 of them) that are present in celery and work symbiotically and systematically with each other and with celery’s regular sodium to raise your body’s pH and rid toxic acids from every crevice of your body, including your gut. Blood Pressure: celery juice lowers blood pressure, and the presence of phthalides relaxes the muscle around arteries, dilating the vessels and supporting normal blood flow. Kidney function: This veggie helps the function of the kidneys by detoxifying the system, and prevents the formation of kidney stones. Nervous system: Celery is loaded with organic alkaline minerals which soothe the nervous system and treat insomnia. 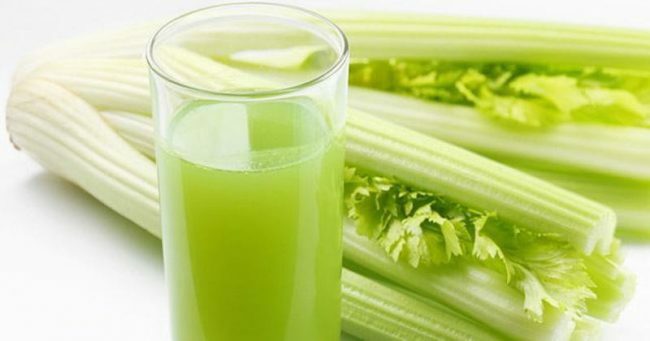 Diuretic: Celery juice is high in sodium and potassium which regulate body fluid and stimulate urine production. Cholesterol: Celery juice lowers total cholesterol and LDL (bad) cholesterol. Constipation: Celery has natural laxative effects and treats constipation. Acidity: Celery juice neutralizes acidity in the body, and balances the blood pH. Weight loss: celery juice prevents food cravings and helps weight loss. Urinary stones: The diuretic effects of celery juice support the elimination of urinary and gall bladder stones. Muscle pain: Celery juice rehydrated the body and is excellent as the perfect post-workout tonic. Cooling: celery juice is excellent during the summer, as it is a refreshing drink that normalizes body temperature. Inflammation: The polyacetylene in celery fights inflammation in the body and soothes the symptoms of rheumatoid arthritis, osteoarthritis, gout, asthma, and bronchitis. If possible, choose green celery, since it is richer in chlorophyll. Also, make sure you pick firm ribs and keep them in a sealed container or in a plastic bag in the fridge. Note that it should be avoided by people with low blood pressure, and you might also need to avoid it if you have skin issues after eating celery. This is a sign of sensitivity to psoralens, the natural protective “fungicide” this veggie produces.